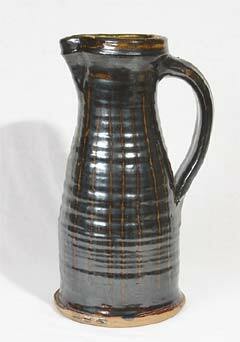 Tall Douglas Fitch jug - 12⅜" (314 mm) high. Douglas Fitch was born in Sunderland in 1964. He trained at the Derbyshire College of Higher Education from 1983, and after graduating with merits in 1985 was offered the position of ceramics research student -- the first at the college. In 1986 he took up full-time employment at a flowerpot factory where he had worked during college vacations. 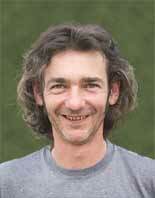 He gained experience in production-throwing, jolleying and press-moulding. After two years he left to establish a company in Liverpool making slip-cast lighting products. He was appointed Ceramics and Sculptural Technician at the University of Plymouth (then known as Polytechnic South West) in 1990 and spent two years demonstrating the techniques of the discipline. He has worked very closely with Clive Bowen and in 1990 joined the kiln firing team for Clive, Nic Collins and Svend Bayer. In his spare time Douglas plays bass guitar in a rock'n'roll band.